67 022 at Colwyn Bay on the express from Cardiff, 8 April. Picture by Greg Mape. 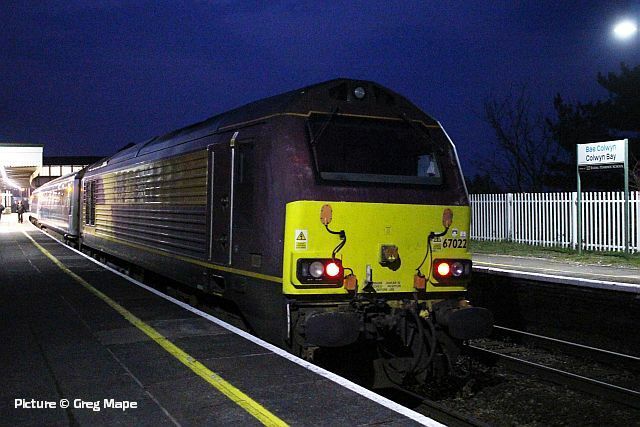 67 014 brings the 09:53 Manchester - Holyhead into Llandudno Junction on 8 April (Tim Rogers). 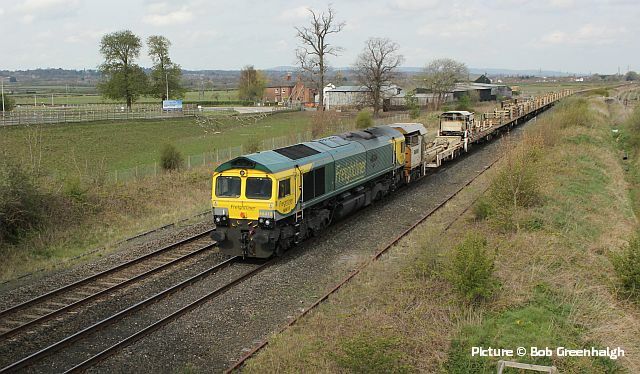 66 418 Patriot passes Beeches Farm on Sunday 14 April with an engineers' train of rail-carrying wagons (Bob Greenhalgh). 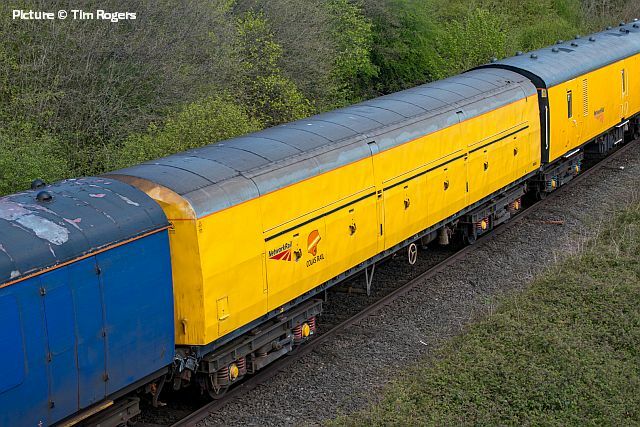 This loco was named in November 2016, the name unveiled by Adam Cunliffe, Freightliner UK Managing Director. Mr Cunliffe's grandfather, Wilfred Wood, is celebrated in Stockport (including the naming of Wetherspoon pub) as one of the town's Victoria Cross awardees. 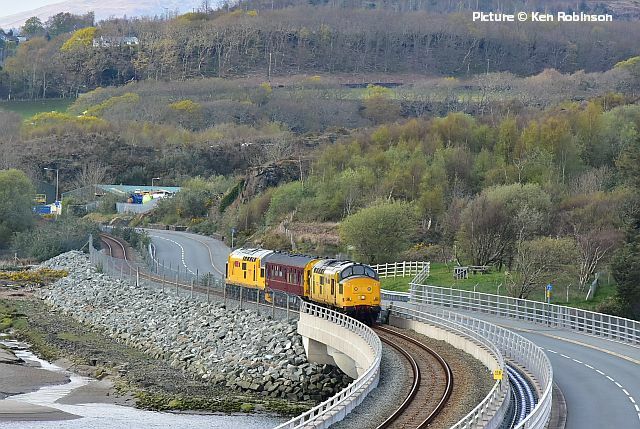 68 003 Astute leads 68 016 Fearless near Mostyn, 10 April (Tim Rogers). 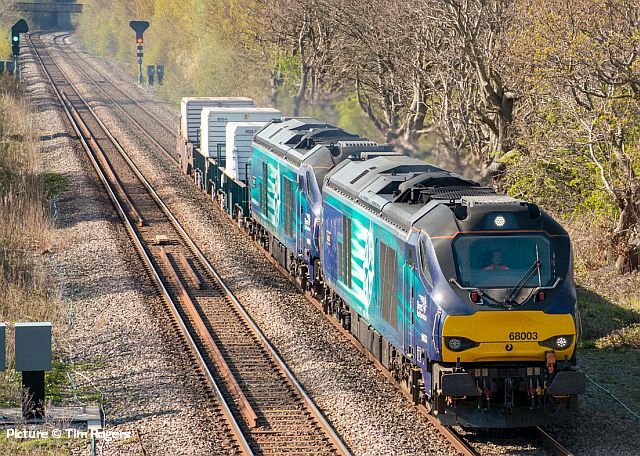 88 006 Juno leads 88 005 Minerva the eastbound flask train at Llanfair PG, 12 April (Ken Robinson). 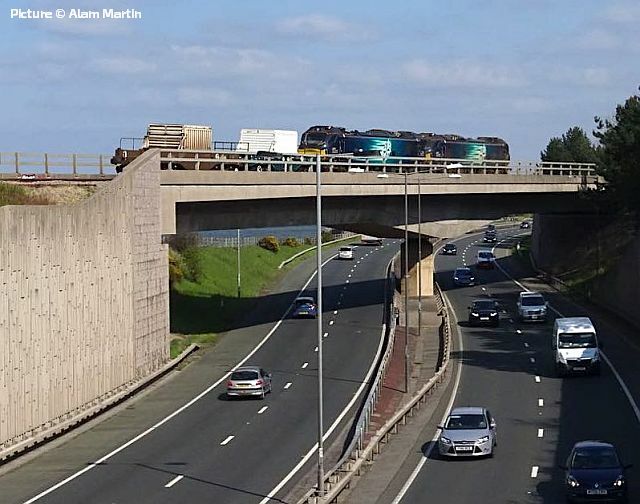 Crossing the A55 at Old Colwyn, 12 April (Alan Martin). 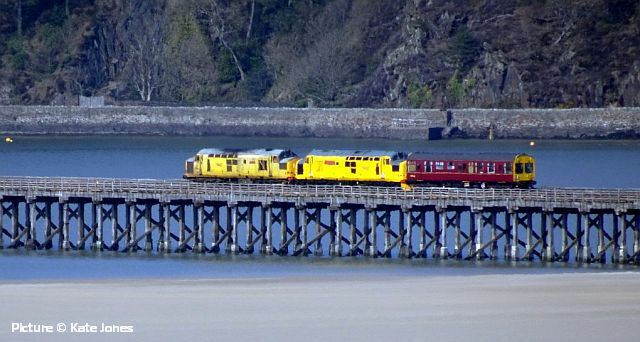 Photographed by Kate Jones crossing Barmouth Bridge on 12 April was a train comprising two Network Rail locos, scruffy-looking 97 304 John Tiley, repainted 97 302 and a single coach, possibly saloon 999506, forming a 12:20 special from Shrewsbury to Porthmadog, calling at Minffordd. 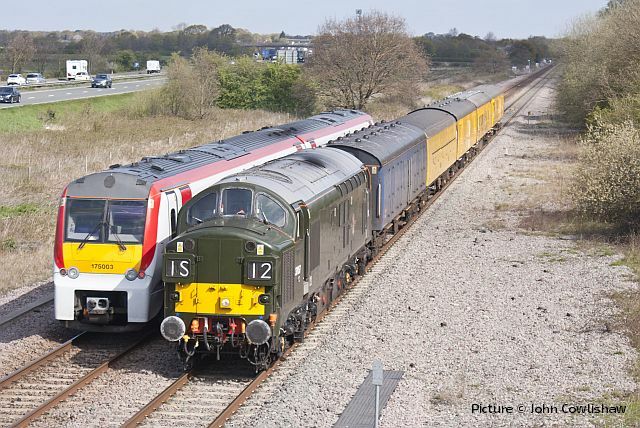 The reason for this was a loco naming ceremony took place at Minffordd (National Rail) station on 12 April. 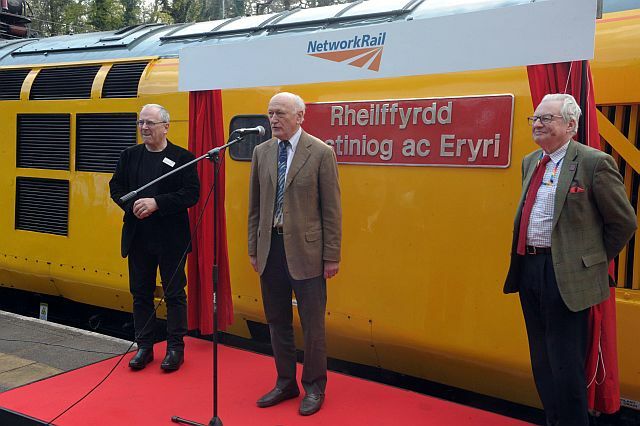 Network Rail ERTMS loco 97 302 was the recipient, and the unveiling was performed by Dwyfor Meirionnydd Assembly Member Lord Dafydd Elis-Thomas, Deputy Minister for Culture, Sport and Tourism, seen on the right of the picture. 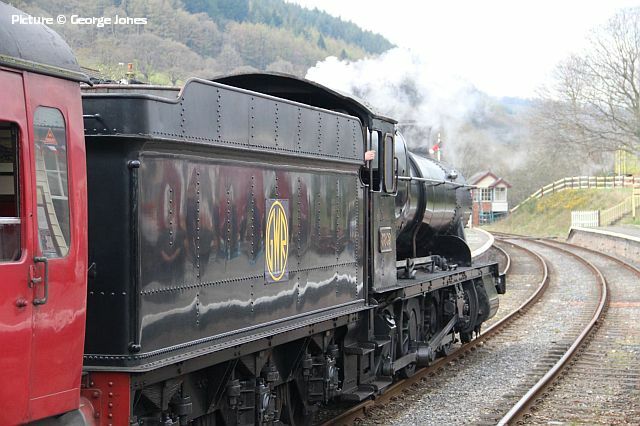 The nameplates, in traditional BR corporate style, read Ffestiniog & Welsh Highland Railways on one side and Rheilffyrdd Ffestiniog ac Eryri (Rheilffyrdd is the plural of Rheilffordd). Also present, having travelled in a Network Rail inspection saloon coach were Sir Peter Hendy, Chairman of Network Rail (left), and Dr John Prideaux (speaking), Chair of the Festiniog Railway Company - once Chairman of BR Intercity. 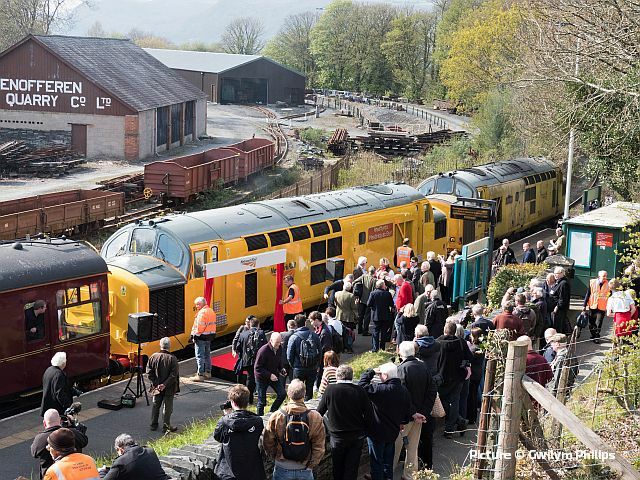 The picture above was taken by Gwilym Philips just after the naming, which celebrates the partnership between Network Rail and the two narrow-gauge lines. After the naming, 97 304 took the train to Porthmadog top clear the line for the 15:37 Pwllheli - Machynlleth, ran round the train and returned it to Shrewsbury. 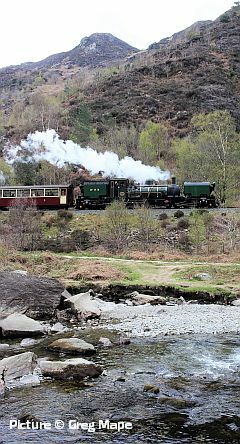 Ken Robinson photographed the ensemble crossing Pont Briwet near Penrhyndeudraeth. 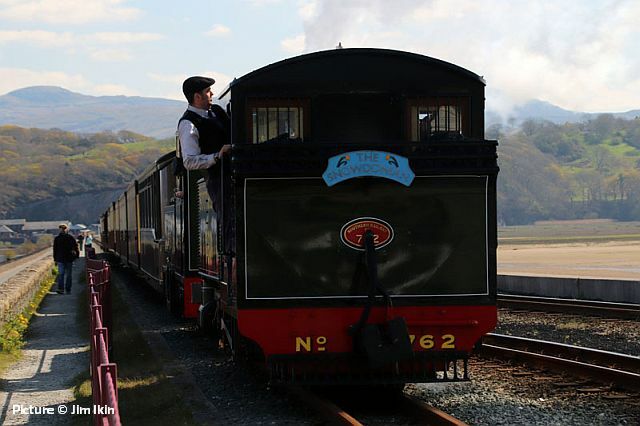 The 17:00 Porthmadog - Shrewsbury near Morfa Mawddach (Kate Jones). 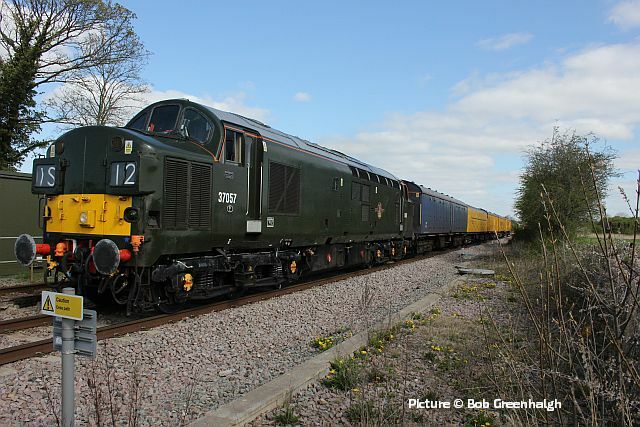 It seems that 97 304 did all the haulage. 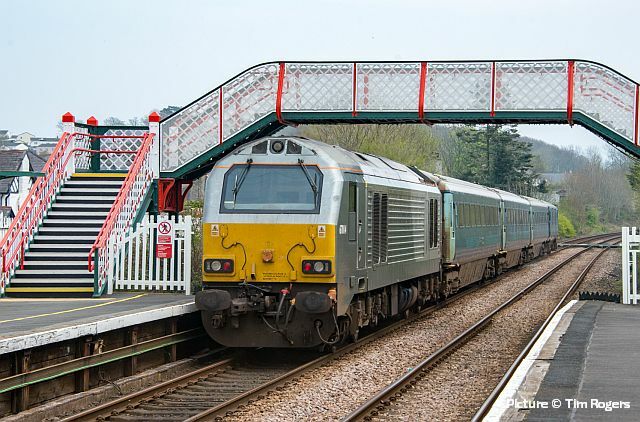 67 014 passes the nicely-refurbished crossing at Llanfair PG station propelling the 13:07 Holyhead - Manchester on 8 April. 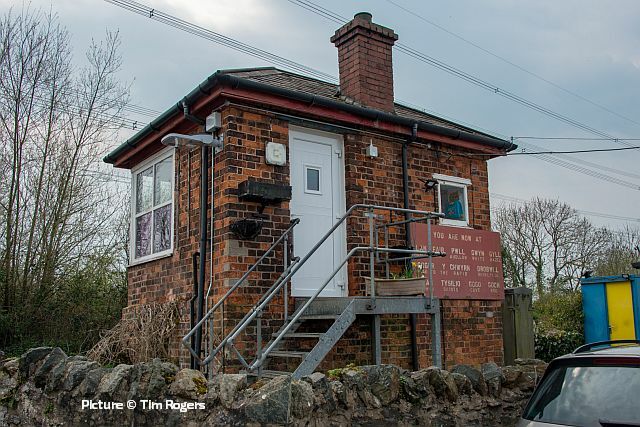 The signalbox at Llanfair PG, which has been reduced in function to a 'gate box' controlling just the level crossing and its protecting signals, is a very early example of a signalbox built by Saxby and Farmer around 1871. It has been altered by the installation of new windows with larger panes than the original; inside is the lever frame of standard LNWR style, installed in 1883. 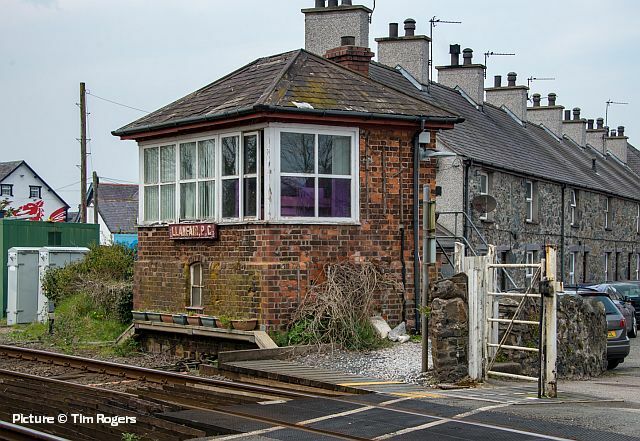 The rarely-published street-side view of the box, which with the postponement of the planned re-signalling west of Llandudno Junction, appears to have a secure future. 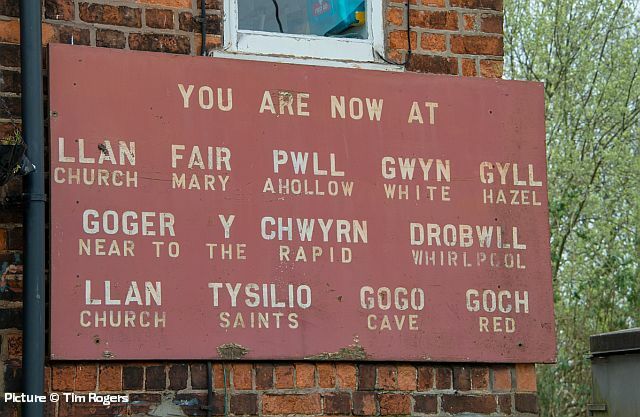 An explanation of the famous long name, which appears to have been created, perhaps in the 1950s, by local staff. 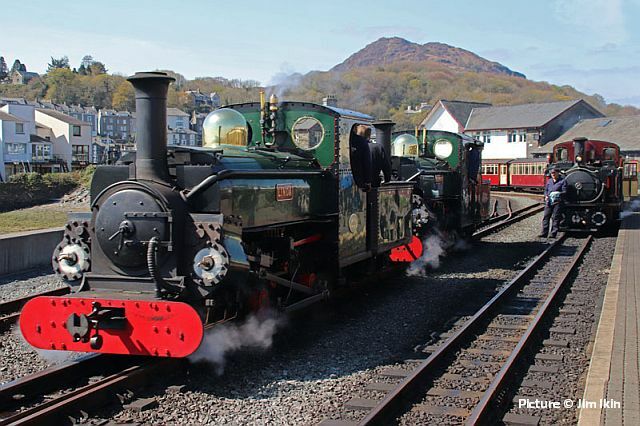 Linda and Blanche come into Porthmadog after bringing the Snowdonian from Blaenau Ffestiniog to Boston Lodge. 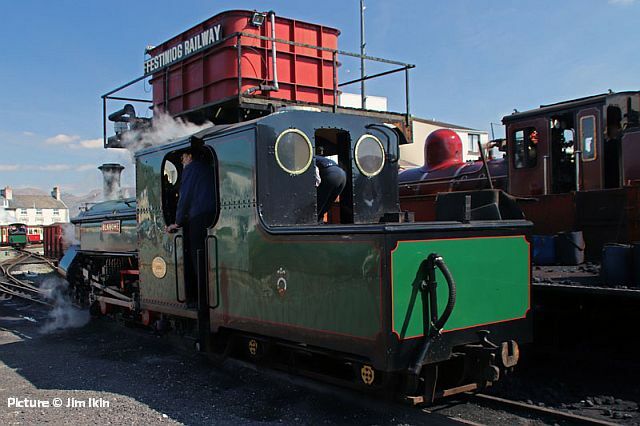 Blanche moves off after coaling. Another 'Snowdonian' runs on 15 June. 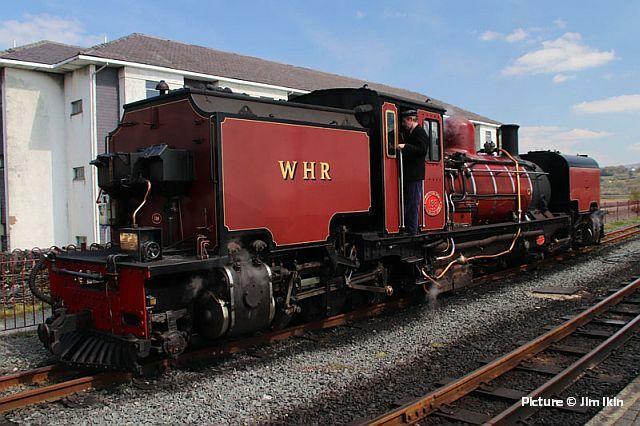 Garratt 138 prepares to take a Welsh Highland service train to Caernarfon. 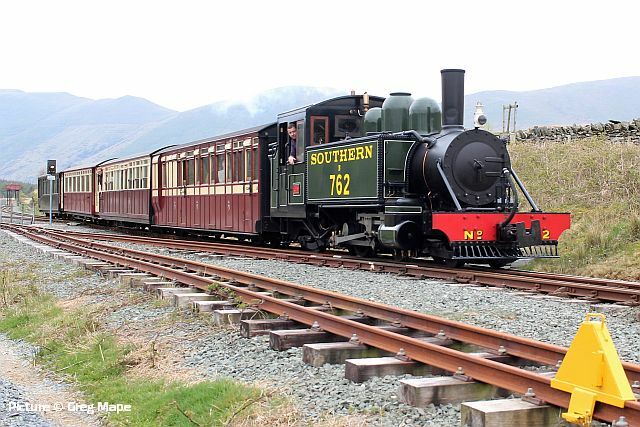 On 14 April, 762 was working alone at Rhyd Ddu on the WHR with a train of heritage coaches (Greg Mape). Running round the train at Rhyd Ddu past two of the unusual signals used by the WHR (Greg Mape). 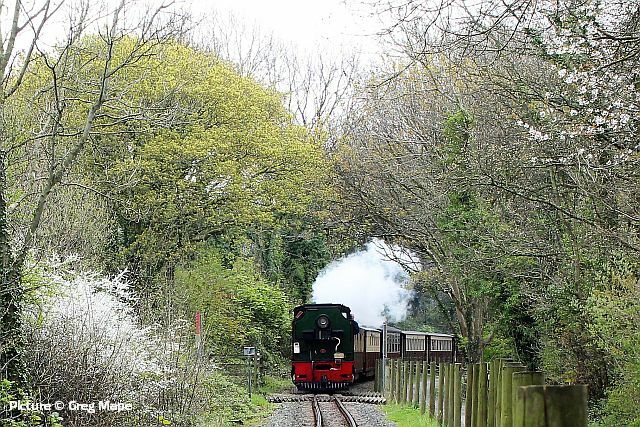 Garratt in the woods near Bontnewydd (Greg Mape). 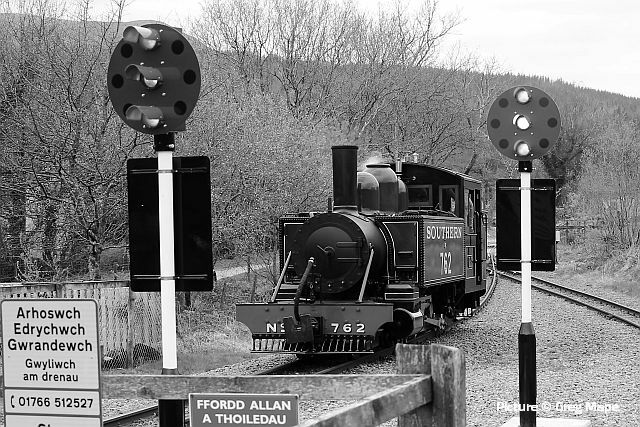 On a less happy note, the RAIB has issued its report on an accident which occurred on 19 January, luckily with no injuries, at Penrhyn Level Crossing on the Ffestiniog Railway. 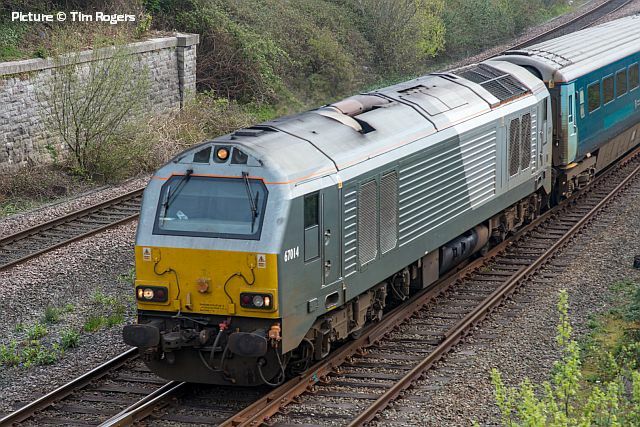 A diesel-hauled engineer's train ran through the gates which were open to road traffic, due to a loss of rail adhesion and failure by the crew to obey company rules. The report can be read on the RAIB website. 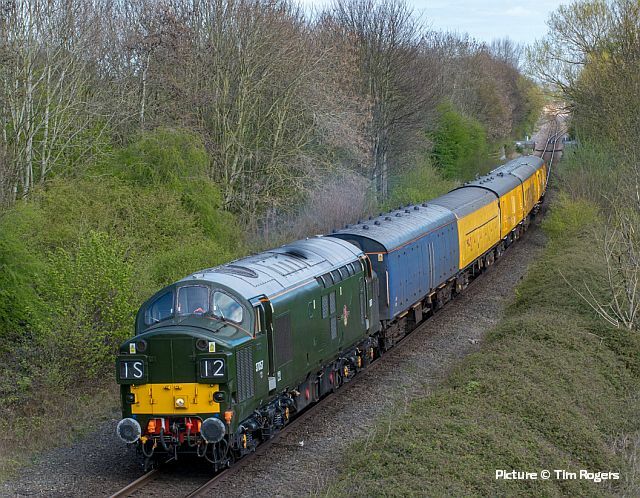 On 11 April, 37 057, now turned out in a good imitation of the green livery worn by these locos when built in the 1960s, hauled an ultrasonic test train, 08:13 Derby R.T.C. 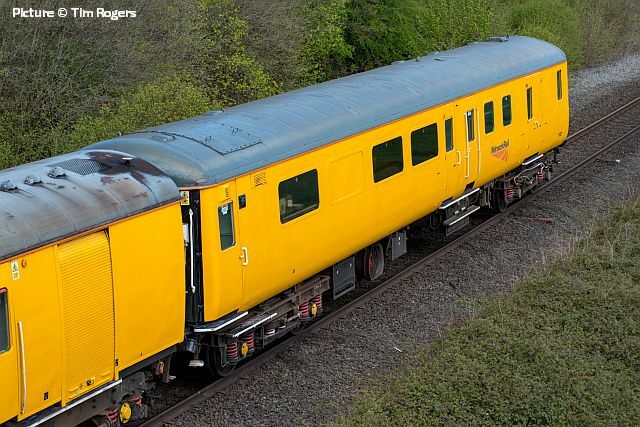 (Network Rail) to Crewe C.S. 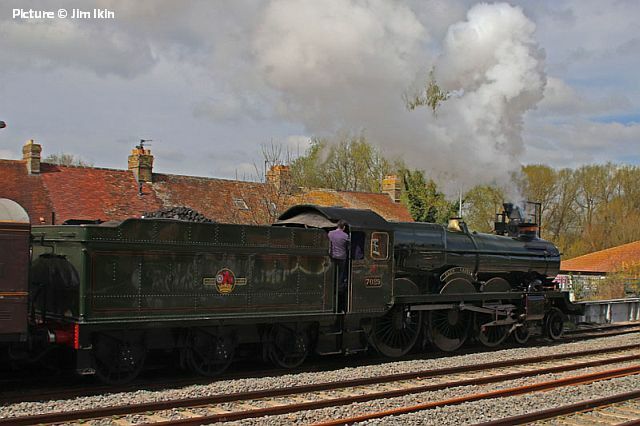 (L&NWR Site) via Chester and Shrewsbury. 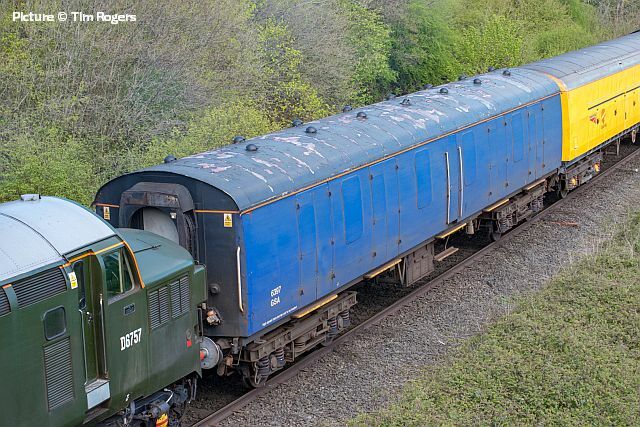 Bob Greenhalgh photographed the train from Balderton level crossing south of Saltney Junction. 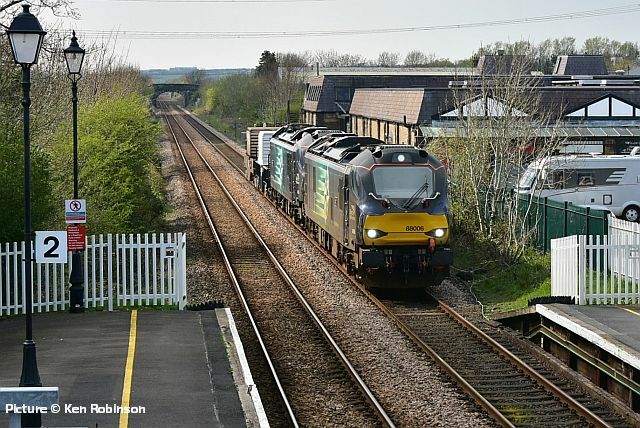 John Cowlishaw, whose picture above was taken from the footbridge at Rossett, writes: The train ran very slowly, taking 23 mins from Saltney Junction and stopped at the signal protecting the start of single track at Rossett Junction. Whilst waiting a technician got down to examine the underside of one coach. 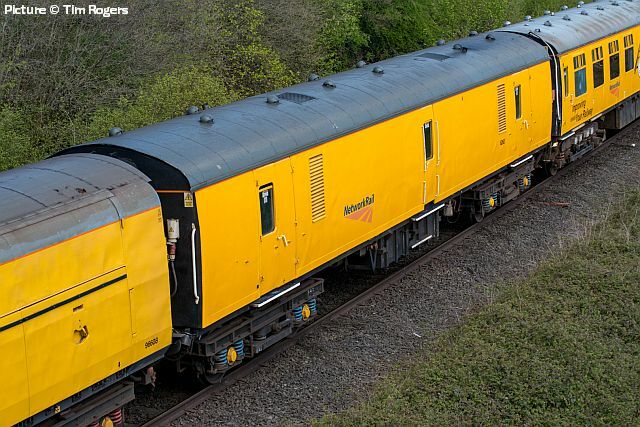 The signal must have been at red, as in due course a TfW liveried 175 003 passed northbound, clearing the single line. The 37 then made a noisy exit to Wrexham. South of Rossett Junction on the single line, Tim Rogers recorded the whole train in detail for us. Mk1, Brake force runner, GSA 6397. Mk1, Brake force runner, 96608 (Ex Motorail). 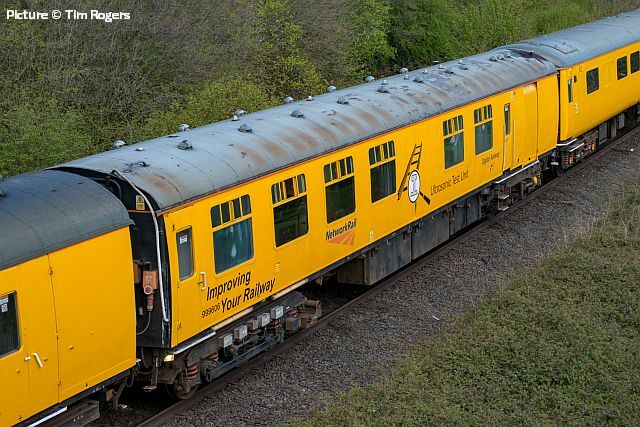 Mk1, Ultrasonic Test Train coach, 999606. Mk2f, DBSO, 9702, driving trailer. 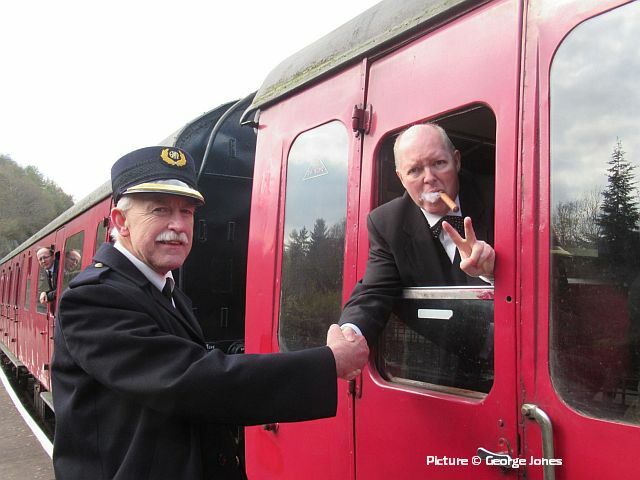 The two-day 'forties event' on 13-14 April featured activity at all four stations on the Llangollen line with re-enactors and singers recreating something of the decade. 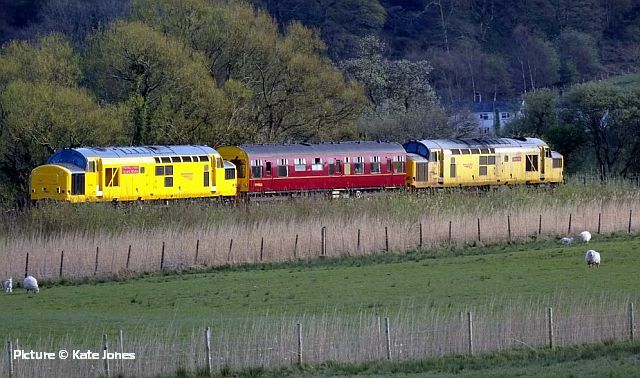 The hourly train service to Carrog featured 80072 on the 4-car suburban set and 3802 on the bar-car train with a swap over for Sunday. 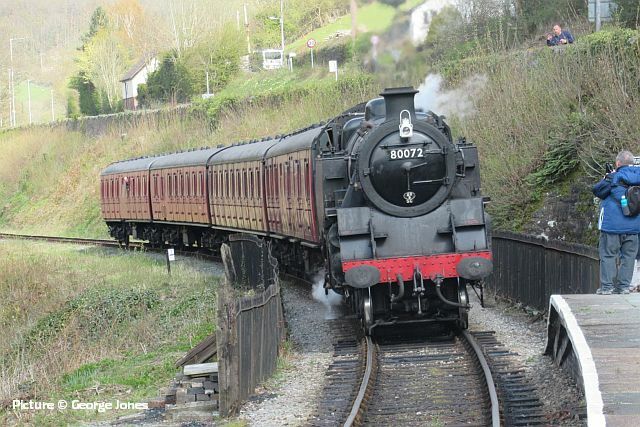 80072 is seen above running into Berwyn with the 'subs' in tow. 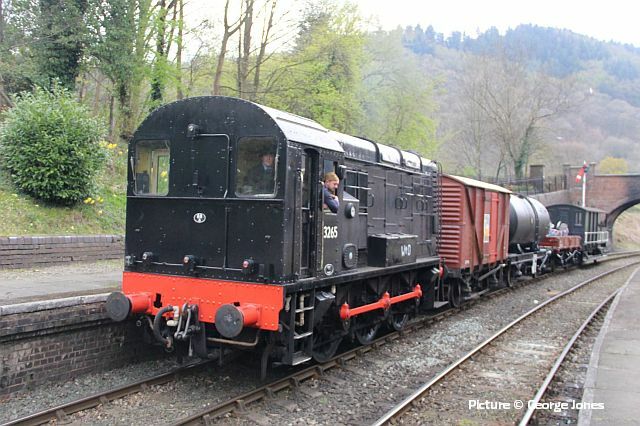 The non-return of 2-6-2T 5199 from Tyseley meant the intended goods train only operated as a shuttle in and out of Llangollen using the Class 08 08 as 13265 marked 'WD' on a short formation. 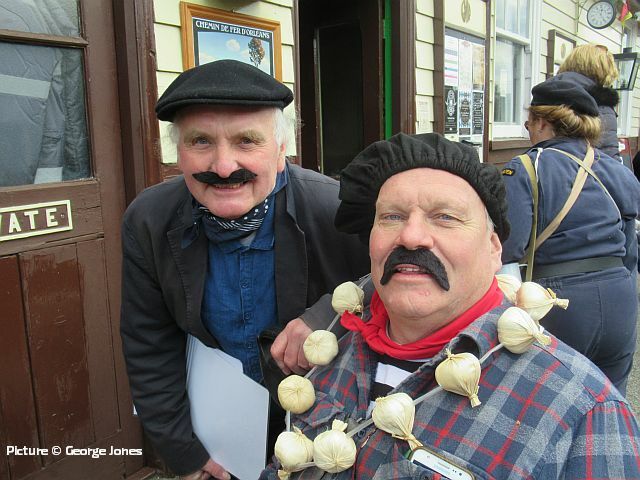 ... and at Glyndyfrdwy a French style was adopted for the Chef du Gare and his assistant - Jean-Paul and Pierre - where the station was renamed Glyn du Frais for the weekend . 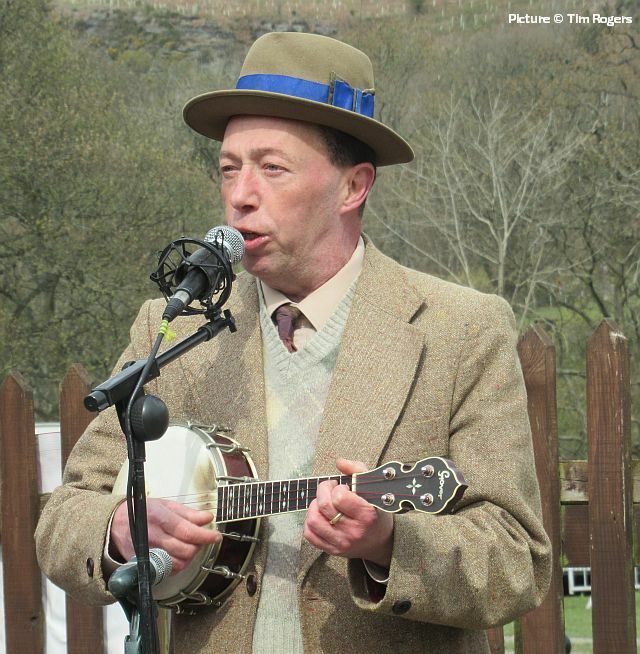 'George Formby' entertained the visitors. All made for an entertaining occasion in sunshine but with a chill wind. 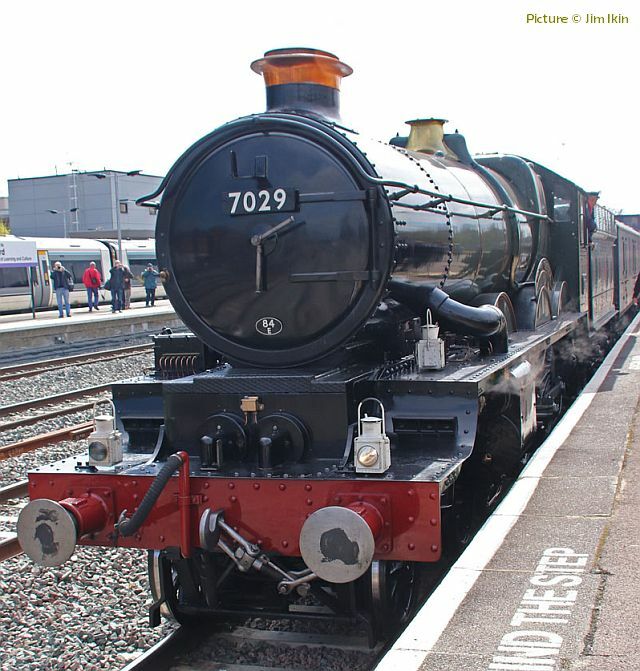 I’m sure everyone will be looking forward to seeing 7029 Clun Castle at Chester on 27 April and for the Llandudno Victorian Extravaganza on 4 May. 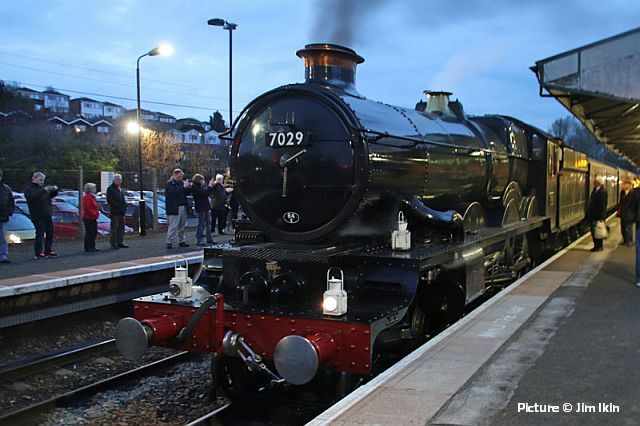 We were lucky enough to travel on Clun’s first mainline excursion (after two evening diner outings} to Oxford (above) on Saturday 6 April. On the return journey we got off at Stourbridge Junction. In the morning we travelled into Birmingham Moor Street from Stourbridge Junction. 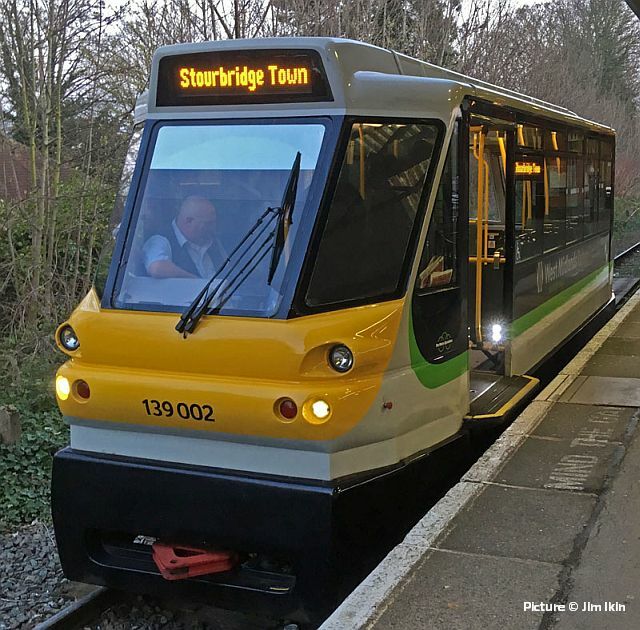 Whilst waiting a class 139 came in from Stourbridge Town. First shown on 28 June 2008 at the Tyseley Locomotive Works Open Day, the 139s start up using LPG and a flywheel then takes over.